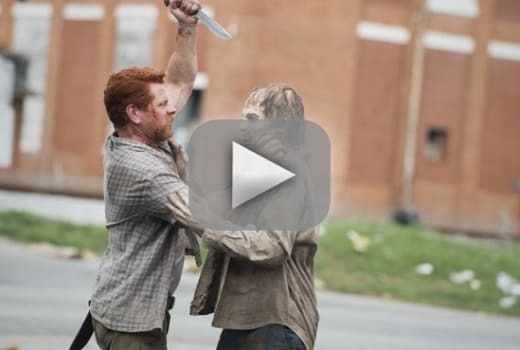 With The Walking Dead Season 5 Episode 5, I found myself worried that the focus shift towards Abraham “We don’t stop” Ford and his ragtag team of survivors wouldn’t lead us any closer to getting to D.C. There would be plenty of stopping, fighting the occasional walker here and there, and a bunch of sitting around and talking while the crew was saddling back up to finally go somewhere. And there was that, and I was rather bored for most of this episode. Perhaps I was bit like Abraham, eager to get a move on instead of really realizing the truth that we were never going to really go to D.C., that Eugene wasn’t on a classified mission that would save the world. I was holding out hope for that new destination much like the survivors were holding out hope that Eugene was the answer to all their heartache and turmoil in the zombie apocalypse. Really, Eugene was just finding a different way to be a survivor. Because when that reveal came about, even if I’d been feeling like he wasn’t the super scientist he claimed all along, the impact of such a moment was felt. For Eugene, the guilt of the lie was clearly weighing on him, and his blurting out of the truth finally got him to reveal that he is super smart, he just doesn’t have the answer everyone wants or needs. Eugene was terrified of the situation beyond just telling the truth, and fearing he wouldn’t be of value, but with Abraham’s insane desire to rush headlong into one of the coolest but most dangerous walker-run locations we’ve seen, he had to say something. And it was one of the dumbest conversations prior to that, but Abraham was so driven with his mission that he was literally willing to get everyone killed just to not go back or find some detour. 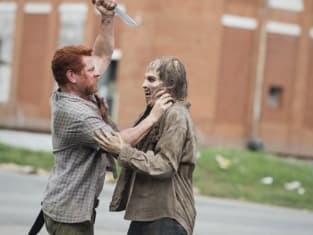 Clearly, with the short flashbacks, we got to see just what kind of man Abraham was before now, but it wasn’t quite a happy one. His family seemed far more eager to run away from him and they met the consequences. So to have Eugene stumble into his life, on the brink of him planing to end his, gave him that purpose and drive to not only get away from his tragic past but push towards real hope and a future. Of course, he wouldn’t want to go back. It wasn’t a surprise to see him pound Eugene, but, wow, that last shot really shocked me. Eugene’s going to be OK, right? Even seeing Rosita, who got to show a much more caring side and actually be more than just standing around in the group, seemed ready to pull her gun on her lover in all his anger. 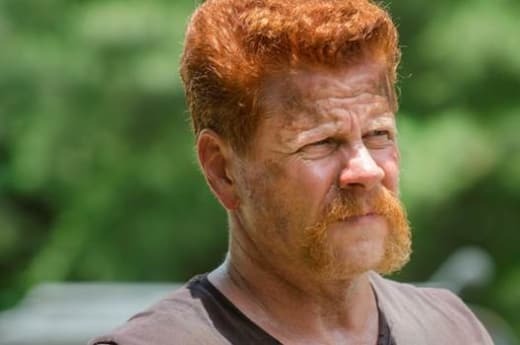 Really, that whole reveal made me feel bad for both Eugene and Abraham, something I thought would take me a lot longer, especially when it comes to the new characters. That scene with Abraham collapsing in the street alone was a memorable one, as his world, his purpose, his drive, was essentially shattered. Don't get me wrong, a good portion of this hour felt tiresome in leading up to Eugene's eventual but probable reveal. And frankly, I'm glad it's out in the open now rather than dragging that one out even further. And maybe that slowness was purposeful in respect to Eugene trying to slow the mission down, even if I wish it didn't take most of the hour to show that. Still, there's now a lot of "what's nexts" left on the table, including who Daryl was talking to and what's up with Carol in the hospital. Certainly, by the end of the hour I was back on board, so I'm just ready to see where all those jumping off points go and where the season is really headed. What did you think of the hour? Was it too slow or just right? Were you shocked by Eugene's truth? And while you're wondering what's coming up next, be sure to watch The Walking Dead online.